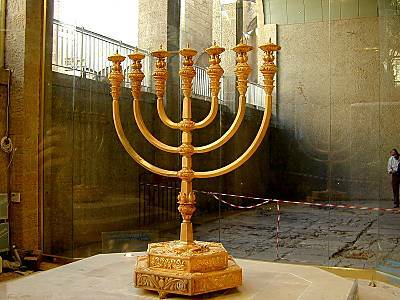 One of the oldest symbols of Judaism is the Menorah, a seven-branched candelabrum used in the Temple. The kohanim lit the menorah in the Sanctuary every evening and cleaned it out every morning, replacing the wicks and putting fresh olive oil into the cups. It has been said that the menorah is a symbol of the nation of Israel and our mission to be "a light unto the nations." (Isaiah 42:6). The sages emphasize that light is not a violent force; Israel is to accomplish its mission by setting an example, not by using force. This idea is highlighted in the vision in Zechariah 4:1-6. Zechariah sees a menorah, and YHWH explains: "Not by might, nor by power, but by My spirit." All other "religious" symbols in the world are man-made and have no real significance. Even the cross displayed in Catholic and Christian churches around the world is a pagan symbol as it represents the way the ancient Romans used to put people to death. Our Messiah -Yahushua was tortured and killed on this hideous man-made instrument of death, so why would anyone want to keep its memory alive by turning it into an icon? It's one thing to remember that our Saviour was killed on a stake/cross, but it's quite another to turn it into an idol that features in churches, necklaces and bracelets, and even our as tattoos on our bodies. The Menorah, the only symbol our Creator designed Himself (all other "religious" symbols are man-made), is said to symbolise the burning bush as seen by Moshe on Mount Horeb (Exodus 3). YHWH commanded Moses to make a Menorah that had one main "stem" and six branches (Exodus 25:31-40); and commanded it to be placed in the "Set-apart place" of the Tabernacle and the Temple. "The Spirit of YHWH shall rest upon him, the Spirit of Chochmah (Wisdom) and Binah (Understanding), the Spirit of Atzah (Counsel) and Gevurah (Might), the Spirit of Da'at (Knowledge) and of the Yirah (Fear) of YHWH." The center of the menorah represents the Spirit of YHWH while the six other attributes are joined into the center pillar. These seven Spirits also signify perfection or completeness. The Fear of YHWH Elohim is a "Spirit" of YHWH; it is a vital spiritual quality for Life in Mashiach. The Fear of YHWH is a personal guide; Hebrew yirah means fear, as in fear/awesome/terrifying contrary to Christian teaching that the Fear of YHWH is not really "fear" but love and respect. Isaiah 29:13 reveals how "the Fear of YHWH is taught by the commandment of men"; in other words, man's religious theology and tradition has made void the Fear of YHWH. Many Christians prefer the term "reverence" over "fear"; Christians also use a title of "Reverend" for their clergymen and ministers; therefore, the term "Fear of YHWH" was first negated and then given a theological/semantic twist to apply to their own leadership, as in the case of "reverend." The Fear of YHWH is noted throughout Scripture; B'resheet/Genesis 20:11; 42:18; Shemot/Exodus 9:30; 18:21; Vayikra/Leviticus 25:17; D'varim/Deuteronomy 10:12 and in more than a hundred places. Without the Spirit of the Fear of YHWH, people will fear man, materialism, relativism and all form of idols, including their religious leaders. The Fear of YHWH empowers Y'shua's followers to uphold the Word of YHWH, regardless of consequences (see Romans 3:18; 2 Corinthians 5:11; 7:1; Ephesians 5:21; Revelation 15:4). THE REVELATION OF YAHUSHUA MESSIAH… These are the opening words to the last book of Scripture (Revelation.1:1). They leave no room for doubt as to the results desired by its author which is a complete exposition of every facet of our Master’s triumphant ministry. An exposé of the all encompassing effects of his Judean ministry on the eternal scene is the objective. Still, a recent survey indicates that many laymen find this book too mystical to be appreciated. Some scholars are now giving it second-class billing in importance for study, considering any interpretation of it to be purely speculation or conjecture and therefore too controversial. Some pastors and religious educators boast of deleting it entirely from their teaching agenda. What accounts for this? Why the apparent paralysis of interest and prevailing difficulty in appreciating the content of this book with such lofty introduction? One major cause for the limited understanding of this book's content is the prevailing unfamiliarity of the average Christian with *Biblical Judaism and its accompanying symbols. The *Menorah (lampstand) is one of those important Hebraic symbols. * Biblical Judaism - Here we make a distinction between "Torah-centric Judaism" [Biblical] and "Rabbinic Judaism" [Talmudic.] A Torah-centric Judaism was the religion out of which the first century church grew maintaining it's biblical contours in the faith and theology of Israel. *Menorah: The Hebrew term for the seven branched lampstand. Why is it so important to understand the Jewishness of this book that some refer to as the "Readers Digest" of Scripture? Dr. John Walvoord of Dallas Theological Seminary has noted that "Of the 404 verses of the Apocalypse, 278 are direct quotes from [Torah], Hebraic Scripture." Unfortunately, historic efforts to delete everything "Jewish" from the doctrine, liturgy and symbolism of the first century church and from Biblical expression has contributed to a certain interpreting handicap. The absence of this all important dimension has left the church ill equipped to understand many of this book's Hebraic expressions and symbolic references. It has deprived us of some richness of understanding that would otherwise be available if the Revelation of Y’Shua ha Mashiach, and the entirety of Scripture for that matter, was interpreted from a Hebraic mind-set. Symbols such as the Menorah are not Jewish in an ethnic sense, nor even Christian in a religious sense, but they are simply Biblical in a divine sense, and therefore eternal and universal (for everyone). The book of Revelation is in large part a book of symbolism. Those who would minimize the importance of symbolism minimize not only the importance of that book but the entirety of scripture. Symbolism plays a crucial role in Biblical revelation and interpretation. One of the first symbols encountered as we begin reading the book of Revelation is the seven-branched Menorah. Y’Shua [the Son of man] is observed in the midst of seven of them. And in the midst of the seven lampstands One like the Son of Adam . . .
“The secret of the seven stars which you saw in My right hand, and the seven golden lampstands: The seven stars are messengers of the seven assemblies, and the seven lampstands which you saw are seven assemblies. This declaration therefore, by association, makes the lampstand a Judeo-Christian symbol and representative of a New Testament believers. It is important that believers perceive the all-encompassing message embodied in the Scriptural lampstand. You may be surprised how up-to-date this symbol of antiquity really is. Christians would do well to become better informed on this aspect of Scriptural heritage in symbolism. The Scriptures teach that the Menorah was and is esteemed of YHWH a symbol extraordinaire. Indeed it has been referred to in Scripture as the "Lamp of YHWH." If it is, then YHWH's people should embrace it and perceive the lessons embodied therein. And he said to me, “What do you see?” So I said, “I have looked, and see: a lampstand all of gold with a bowl on top of it, and on the stand seven lamps with seven spouts to the seven lamps. The lampstand (Menorah) is conceivably the most comprehensive of all Scripture symbols. As such, it is important that believers investigate the origin, use and purpose of this symbol referenced in both Old and New Testaments. We will discover that this lampstand symbolizes many things such as the Nation of Israel, the believers, the Set-apart Spirit, the Word of YHWH, the Seven Spirits of YHWH, even the Master Yahushua Messiah himself as "the light of the world." The first direct mention and detailed description of the Menorah is found in Exodus 25:31-40. Moshe had just returned from Mount Sinai where he had been in communion with YHWH. It was there that he had been instructed to make the lampstand. Not only had he received detailed instructions concerning the critical design of this instrument of light to be placed in the Tabernacle, but also of the various other implements that would be used for service in YHWH's divine worship system. “And you shall make a lampstand of clean gold – the lampstand is made of beaten work. Many of these symbols ceased to be used under the New Testament but not the Menorah and for good reason as we shall clearly show. Obviously, YHWH demands precision. Consequently, the Menorah has a divine configuration. From the Scriptural description of the lampstand spelled out in Exodus Chapters 25 & 37 (reinforced by historical record), we discover that a numerical pattern emerges. There were 7 lamps on the top of the Lampstand, 70 (*2) garnishings on its branches and 12 foundational divisions of its stacked hexagon base. The specific numbers 12, 70 (2), and 7 represent a basic numerical pattern of operation for both Israel and the Church. In the governmental structure of Israel there were 12 men who served as leaders or heads over their tribes with whom Moshe could communicate (Num. 1:44). Moshe chose 70 elders of the people to be with him on Mount Sinai as a support system (Num.11:16). After Moshe’s departure, Joshua appointed 7 priests who led the camp of Israel into victory blowing the rams horns (Joshua 6:4). In the same manner, Y’Shua began the formation of the New Covenant Church (Heb 8:8) during His earthly ministry by choosing 12 apostles who became the foundational governing pillars of the church (Mk. 3:14). He then appointed other "70" and sent them out in ministry (Lk. 10:1). And after this the Master appointed seventy others, and sent them two by two ahead of Him into every city and place where He Himself was about to go. After His crucifixion, the 12 appointed a body of 7 men to assume a great portion of the care and responsibility for the assemblies so that the twelve apostles could return to Jerusalem and give themselves continually to prayer and ministry of the Word (Acts 6:2-3). These seven men were far more than deacons as is commonly supposed. They were all powerful ministers clearly demonstrated by Philip and Stephen. Obviously the very framework of YHWH's government for His people is reflected in the design of the lampstand. We find these numerical patterns and or multiples of them, in many Old Testament and New Testament demonstrations. References to them are particularly noted in the book of the Revelation of Yahushua ha Mashiach. *The knops, flowers and bowls appear to add up to seventy plus two. There seems to be a bit of mystery regarding the apparent conflict in translations as to whether this is "seventy" or "seventy- two". However, there does seem to be a nagging presence of this nuance of a supplementary two, even in some Old Testament passages. Be that as it may, the number 70 plays the dominant role in Biblical expression and numerology. Concerning the lampstand the first-century Jewish historian, Flavius Josephus confirms "It was made with its knops, and lilies, and pomegranates, and bowls (which ornaments amounted to seventy in all);"
Is it any wonder then, that YHWH has placed such significance on this symbol and given it "high profile" from Genesis to Revelation when you consider that it represented the presence of all truth, hence the light of the world? 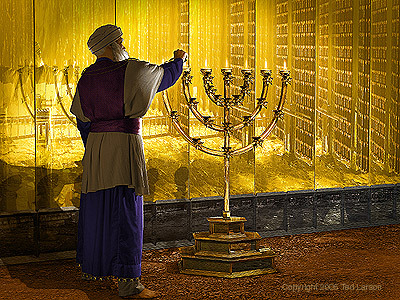 YHWH informed Moshe that the Menorah was to be located in what was known as the "Set-apart Place" in the sanctuary of YHWH. Throughout the many years of Temple worship, it was tended to on a daily basis being trimmed every morning and lighted by the ministering priests. It was the only source of light in the wilderness tabernacle as it continued to be in all future Temples except for the annual glowing of the Shechinah glory visitation in the most Set-apart place. The lampstand occupied a place of great prominence among the instruments used in worship. The worship of them would be a sin. While mankind was commanded of YHWH not to bow down and worship symbols, they play a crucial role in promoting spiritual understanding. These "things that are made" include not only those things that God made in the creation such as the earth, beasts, trees, stars, etc., but included those things that He commanded men to make for revelation purposes such as the Menorah. YHWH is not worshiped in these things that are made but He is most definitely revealed through them. And the young Shemu’ĕl was serving YHWH before Ěli. And the word of YHWH was rare in those days – no vision breaking forth. And the lamp of Elohim had not gone out in the Hĕḵal of YHWH where the ark of Elohim was, and Shemu’ĕl was lying down to sleep. Here the Menorah becomes identified as "THE LAMP OF ELOHIM". As such, the Menorah is a timeless symbol. This seven-branched lampstand, for many Christians (if recognized at all) has been regarded as little more than a Jewish relic. However, this YHWH given symbol should not be considered something "out of date" nor simply Jewish but divine and therefore timeless. Notice in the foregoing Scripture that the Menorah was not referred to as the "Lamp of the Jews" or the "Lamp of the Temple" nor the "Lamp of the Synagogue" but the LAMP OF ELOHIM. Why? Because it was YHWH ELOHIM who designed it, had it constructed, and commanded its use (Ex 25:31, Number 8:2-4). The lampstand, perhaps better than any other item that YHWH commanded Moshe to make, serves the ends and purposes of revelation by symbolism. We will discover that the Menorah symbol regularly surfaced in the spiritual experiences of many other prophets and visionaries as it did with Samuel. Notice the circumstances surrounding Samuel's prophetic call and the existing condition of Israel. The lamp of YHWH was going out and soon afterward the Philistines captured the Ark of the Covenant. Eli, the judge and High priest of Israel, had died and a child was born to Phinehas his son who's name says it all, Ichabod meaning "The glory of YHWH has departed." In principle this story could very well parallel many of the conditions within the Assemblies/Church in history and serve as a prophetic picture of our own time. The setting was at evening time, the light from the Lamp of YHWH was shining less brightly in the temple and there was "no open vision" (revelation). It is very unusual that the lamp of YHWH would have been going out at the very time of day when it normally should have been freshly fueled and burning its brightest. The Church can learn valuable lessons from this story. We could very well be approaching the end of the age (evening). The Lamp of YHWH, which is the Word of YHWH (Psa. 119:105) and our understanding of it, has been seriously eroded due in great part to our forsaking the foundations of our faith rooted in the Hebrew heritage. The judgment of YHWH is impending as Yahushua predicted. “Then the reign of the heavens shall be compared to ten maidens who took their lamps and went out to meet the bridegroom. “And five of them were wise, and five foolish. but the wise took oil in their containers with their lamps. “Then all those maidens rose up and trimmed their lamps. “Let my instruction fall as rain, My speech drop down as dew, As fine rain on the tender plants, And as showers on the grass. “For I proclaim the Name of YHWH Ascribe greatness to our Elohim. And you children of Tsiyon, be glad and rejoice in YHWH your Elohim, for He shall give you the Teacher of Righteousness, and cause the rain to come down for you, the former rain and the latter rain, as before. whom heaven needs to receive until the times of restoration of all matters, of which Elohim spoke through the mouth of all His set-apart prophets since of old. And he answered and said to me, “This is the word of YHWH to Zerubbaḇel, ‘Not by might nor by power, but by My Spirit,’ said YHWH of hosts. Christians from time to time can be heard reciting the inspirational and familiar phrase from this notable scripture "Not by might, nor by power, but by my spirit, saith the LORD of hosts." It has been applied in numerous ways and unfortunately, most often out of context (salvation, healing, miracles, etc.) While this application may be well intended, the message can be lost. Now, what is there about the sight of the golden lampstand (Menorah) that would evoke such an utterance? Not many Christians would give a similar response to such a vision. Why? Because, for the most part, we would not recognize the Menorah nor appreciate it for what it represents. In this case it symbolized the seven-fold spirit of YHWH at work in the restoration efforts taking place in Jerusalem. After being held in Babylonian captivity for 70 years, the Jews were frail and few in number. It was only through a special anointing from YHWH that they were able to maintain their determination in the face of much discouragement to continue rebuilding the Jerusalem walls and the Temple of YHWH. This extraordinary anointing for restoration was symbolized by the lampstand. “Do not think that I came to destroy the Torah or the Prophets.1 I did not come to destroy but to complete. … and the seven lampstands which you saw are seven assemblies. “But I hold this against you, that you have left your first love. “So remember from where you have fallen, and repent and do the first works, or else I shall come to you speedily and remove your lampstand from its place, unless you repent. A spiritual interpretation could be reasonably rendered from this passage but evidently there is also a very practical side to consider. There is every reason for us to conclude that this Menorah symbol was physically on display in those first century assemblies/churches, and for good reason. First, as a congregation, they were more "Judeo-Christian" in nature and appearance than the subsequent church that became more Greko-Roman in orientation. The indication is that the lampstand must have served as an official symbol of identity with that body of believers originating in Jerusalem who had been birthed of Judaism. YHWH did not want the Ephesus congregation, if it remained in its existing loveless condition, to even be considered by the public as representing the Messianic Faith. Symbols provided by YHWH in the Scriptures are eternal and universal. The spirit of Love is central to the very essence and nature of YHWH as is demonstrated in the symbolism of the lampstand. The center lamp of the Menorah is, in Hebrew, called the Ner Elohim the "Lamp of YHWH" as well as Shamash “the attendant”. Since the Scriptures teach that "YHWH is love" (1 Jo 4:8), one might even call this center light the "Love Lamp" amidst the seven. Therefore the threat of the candlestick's removal was very significant. The absence of love was sufficient cause to threaten the disenfranchisement of the Ephesus assembly from the body representing Messiah in that area. Obviously few if any Christian churches of today would feel intimidated by the threat of losing a Menorah (assuming one even existed), considering the lack of understanding by the church of the meaning of this symbol of antiquity. Even the familiar interpretation of what this threat implies (departure of the presence of YHWH) requires exhaustive teaching today. Such was not the case for the assemblies of the first century. It is quite evident that they were much closer to Scriptural Judaism in thought, practice and symbolism than is the Christian church of today, and they clearly understood the implications of this threat. There are, however, some indications that significant Judaic restoration to the body of Messiah is imminent. Increasingly, Christian pastors and congregations are becoming inspired of the Set-apart Spirit to introduce many of these Judaic principles into their teaching and worship. This is also being demonstrated by the reintroduction of the Scriptural Feast Day celebrations [seven in all], the use of the Hebrew names of YHWH, Sabbath celebrations, etc. None of these practices were foreign to the first century congregations. It should therefore come as no surprise to discover that the Menorah symbol was on display within these Assemblies in Asia. Their understanding of these Scriptural things is assumed in these letters. That no doubt accounts for the abundance of Judaic expression in the book of Revelation. Sha’ul is not suggesting by the term "birth" that the people be saved again or born again. It was not a case of Y’Shua being absent from their hearts, but rather there was an absence of the form of Messiah in their lifestyle, their value system and in the corporate setting of the local assembly. Y’Shua had travailed for their eternal salvation, but it was Sha’ul who had "travailed" for their birthing and development as a church in the formative years in the city of Galatia. It was he who had taught them the word so that they might become a living lampstand. Sha’ul did not say they needed Y’Shua formed in them, but Messiah * there is a difference. The name Yahushua means "savior", while "Messiah" means the "anointed" or "the anointed word." The "form of Messiah" means a Scriptural pattern symbolized by the lampstand. The Galatians had forsaken their Divine heritage and began taking up the "elements [patterns] of the world." In this same chapter, he reproached them specifically for having adopted the celebration days and festivals of the gentiles, forsaking the Scriptural order, hence contributing to their loss of the "form of Messiah." The Apostle Sha’ul was travailing for a corporate restoration or rebirth. This is exactly what YHWH is calling for in the body of Messiah today - a Church re-birthed in Scriptural patterns and Truth. Have you ever considered what all might be included in the familiar term a "Christ-like" spirit, and in what ways is it manifested? Well, it undoubtedly includes all of the more familiar ways that readily come to mind (i.e., love, joy, compassion). However, there is one character trait in a Christ-like spirit with which the Church is much less familiar i.e. the spirit of prophecy. The entire life of Y’Shua was an exercise in prophetic display. Do not construe the word prophecy as meaning a spirit to prophesy. It was not in the nature of Y’Shua’s ministry to go about making many grandiose predictions but rather to fulfill the messianic prophecies of old. He was the Light of the World because He brought to light and lived a life of fulfilling prophecy. His entire life was a divine orchestration of fulfilled Scriptural prophecy which set him apart from all would-be messiahs. His other (mystical) body, the Church, should do no less if we are to become the light (Lampstand) of the world. It is the spirit of prophecy that will bring greater Scriptural mission and purpose to the body of Messiah. The Old Testament is prophecy declared, the New Testament must be prophecy revealed and fulfilled (Mt. 11:13, Acts 3:21) The restoration of these Scriptural symbols, celebrations and values to the Gentile church is a prophetic mission in and of itself. Isaiah foretold of its occurrence when speaking of the "strangers" who would keep His Sabbaths and His covenant (Isaiah 56). Therefore, YHWH will and is abundantly blessing those assemblies/churches that are motivated with the Spirit of prophecy and who place an emphasis on His word being fulfilled. They understand that a return to the Hebraic foundations of our faith is a prophetic program being fulfilled in our time. Like Zechariah, these assemblies function in the spirit of the minor prophets symbolized by the Menorah (Zec 4:6) They are discovering what YHWH is doing and work with Him. They are not working for YHWH; they are working with YHWH. As a result, these believers are becoming living LAMPSTANDS of prophetic restoration. And out of the throne came lightnings, and thunders, and voices. And seven lamps of fire were burning before the throne, which are the seven Spirits of Elohim. The purpose for mentioning these seven spirits ablaze before the throne of YHWH is to show that the principles of the lampstand are also manifested in the heavenlies. For the Church to be a living lampstand in the earth, and the light on a "lampstand" that Y’Shua predicted (Mt 5), all of these seven spirits of YHWH must be burning in our personal lives, as well as in the corporate Assembly/Church. 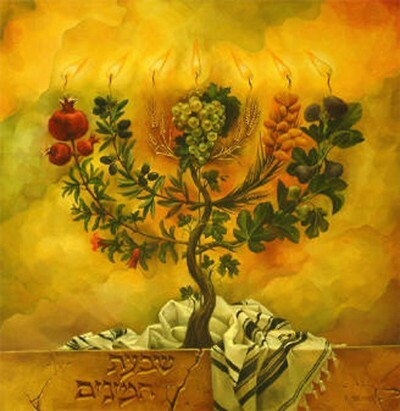 The seven-branched Menorah was given to constantly remind us of that important truth. Even a casual observer of the Scripture must draw that conclusion. And I looked and saw in the midst of the throne and of the four living creatures, and in the midst of the elders a Lamb standing, as having been slain, having seven horns and seven eyes, which are the seven Spirits of Elohim sent out into all the earth. Should we not pray "Thy will be done on earth as it is in heaven" and participate in the process? The Menorah symbol is a constant reminder of that imperative. Obviously, from the preferential treatment accorded the beautiful golden lampstand in Scripture, it is indeed esteemed of YHWH a symbol extraordinaire`. As the body of Messiah progresses in restoration and renewal, this symbol should occupy a place of greater prominence in our assemblies and our spiritual value system. It is fitting and proper that this symbol be displayed in all Christian churches and in the homes of believers (Jew or Gentile). The Lampstand/Menorah is the Scriptural symbol of the Assemblies/Church. While the preaching of the cross and its message is indeed "the power of YHWH unto salvation" (Rom. 1:16), so horrible was the scene at the cross, that the Heavenly Father could not bring Himself to look upon it. Therefore it is doubtful that Y’Shua, if He was on earth, would encourage the historic emphasis and high profile Christianity has placed on the emblem of the cross. Although the message of sacrifice and redemption would have remained the same, it is unlikely that He would "cherish the old rugged cross" any more than He would some other instrument of cruelty that may have been used to cause His suffering and death. Indeed, it is entirely possible that He would even discourage its being displayed. The cross would bring back haunting memories of excruciating torment as is indicated by the writer of Hebrews when he states that our Saviour "endured the stake despising the shame" (Heb. 12:2). Perhaps this is why the cross is so glaringly missing, indeed totally absent, from the abundance of symbolism to be found in the book of the "Revelation of Yahushua Messiah." It is simply nowhere there to be found. "NOT BY MIGHT, NOR BY POWER, BUT BY MY SPIRIT SAID YHWH OF HOSTS" (Zec 4:6). Y’Shua said that we were to be the "light of the world." And that we were to put our light on a lampstand (Mt. 5:15). Y’Shua is the light that lighteth every man that cometh into the world. Now we are to be the light to the world – as we reflect the full light of the menorah, with YHWH/Y’Shua at the centre of our light. We will shine forth as lights in a world of darkness! Master Yahushua ha Mashiach, you are our guiding light and our salvation!